…Naw. Who can complain about comparing versions of such an iconic American dish? Only traitors to the Red, White, and Blue. 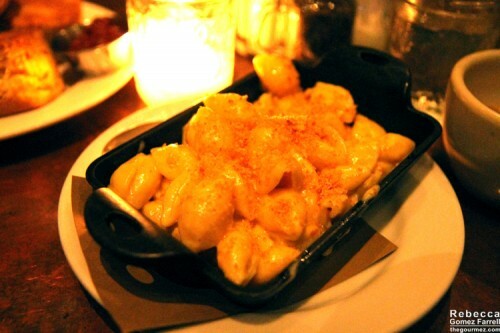 I am not condoning a mac & cheese McCarthyism, but be proud, cheese lovers. Be proud. And be willing to add your own Bay Area faves to the list. The 7×7 list skewed strongly to San Francisco, so I am fully aware there are other contenders for the crown — and you should be fully aware that I’m willing to take any excuse to hunt them down. Only Oakland’s Homeroom was not located in San Francisco, though Paragon also has a Berkeley location. Additionally, two of the competitors have closed since I began my journey through waves of cheddar and breadcrumbs. Q, previously located in the Inner Richmond, shuttered just days after we visited. Grub closed before we had the chance to check it out. Such is the restaurant lifespan. 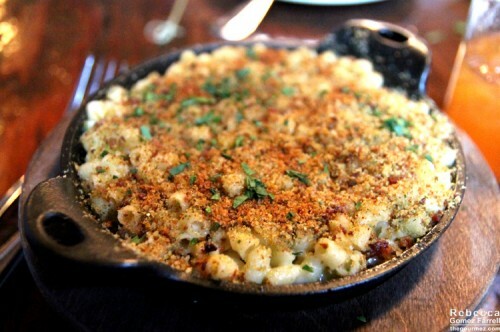 Without further adieu, here is my current list of best Bay Area Mac & Cheeses, from bottom to top. The biggest ball in this mac & cheese’s court is its reasonable size at an also reasonable price point of $7. Pleasing grit from fine breadcrumbs and grated parmesan were also plusses, as was the rare stringy cheese element. Rosemary would have been a nice added layer of flavor if enough of it were used. As it was, the mild-tasting white cheddar and parmesan couldn’t stand up to the iron flavor given off by the skillet. While I was in large part turned off from Paragon’s mac & cheese due to the unwelcome intrusion of metal, Farmer Brown’s simply failed to impress. It’s a straightforward creamy cheddar offering. Although I support honoring the classics, the ingredients didn’t stand out. And using shells instead of macaroni doomed its placement on this list; the shells’ flaps often stuck together, making it difficult for the cream sauce to swim inside. Not enough sauce in the noodles? A faux pas for this dish! The flour was also not fully incorporated into the cream, giving it grit in all the wrong places. That job function should be performed by the breadcrumbs. 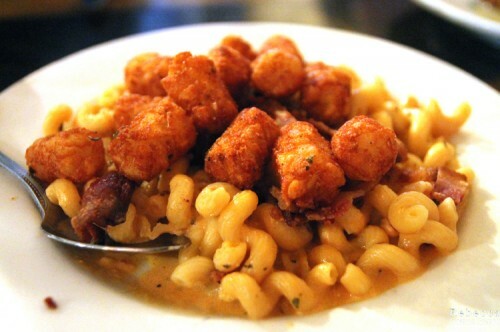 Despite its attempts to add whimsy to a conventional mac & cheese sauce (tator tots instead of bread crumbs! Spiral pasta! ), Q’s dish was ultimately too expensive for too small of a serving at $13. The bacon we tossed on for an extra $2 didn’t add much but crunch that the tator tots already had under control. Points for a sauce that tasted close to boxed mac & cheese — we all admitted to being fans of that cabinet staple — but it wasn’t enough to set Q apart. Rankings are getting difficult now, the competitors set apart only by tenths of a point…if I had used points. I’m way too lazy for that. 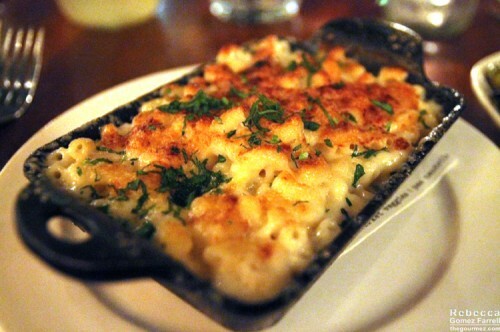 What I mean is that it’s really a matter of subjectivity when I can rank a mac & cheese like the Blue Plate’s this low. It was great! The primary use of drunken Spanish goat cheese gave it a memorable tanginess that built with each bite. It’s a simple dish that highlights the quality of the ingredients…but in this cutthroat competition, simple isn’t quite enough. People will be aghast to see Homeroom appear so low on this list; it is a restaurant dedicated to the craft of mac & cheese after all! The ability to customize your order is a big plus, and they do know how to match ingredients to their sauce variations, generating vastly different takes on the mac & cheese. But boy, are they all rich and dense — I don’t think I could ever finish a serving on my own. If you love leftovers, that’s not exactly a fault. But combined with the hour-long wait and somewhat lacking customer service, I needed to be overwhelmingly impressed to rank Homeroom higher. Instead, I was too full to walk out of my own accord. Note: Your opinion likely varies on the negative value of these factors. Mission Cheese had one of the few stringy cheese offerings we encountered. The large portion size was a plus, as was the creamy, washed-rind, cow’s milk cheese. A bit on the dry side, likely due to the extra large macaroni, but the dish was most memorable for its spicy pepper kick. There is one reason, and one reason alone, that this did not take first place. As a sandwich, I felt I had to handicap its participation. I probably should have tried the actual dish of mac & cheese that the restaurant offers, but how could I pass up a grilled cheese at a place with grilled cheese in its name? 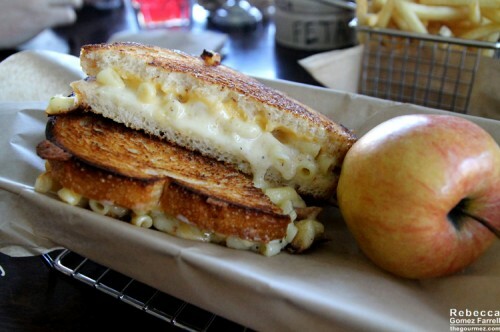 And I am forever grateful I did, because the stringy gruyere and creamy cheddar between those perfectly grilled slices of sourdough made the grilled mac & cheese sandwich an experience I will never forget. The masterstroke? The cooks’ expertise demonstrated through knowing that overcooked macaroni actually improves the textural qualities of the sandwich. This was a stand-out from the moment I learned bacon fat is used in making the cream sauce. Some might call that cheating, but once they took a bite, I don’t think they’d care. I sure didn’t. Just give me another spoonful, thanks. Using ditalini, rather than macaroni, was a curveball that functioned quite well for soaking up sauce in every bite. The downside? 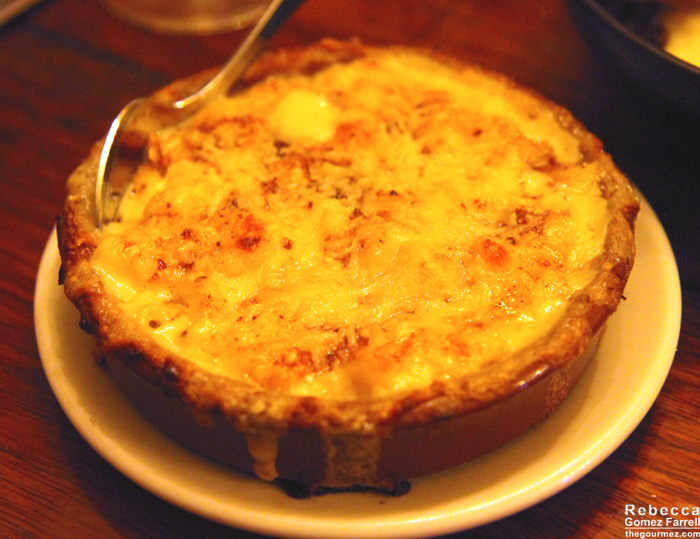 The cheeses were overpowered by all the bacon infused and stirred into the dish. Note: This is only a downside if you don’t love bacon. It’s a shame that my #1 choice ended up with my worst picture of the competition. The light was really dim, okay?! Perhaps my words can do this winner more justice. 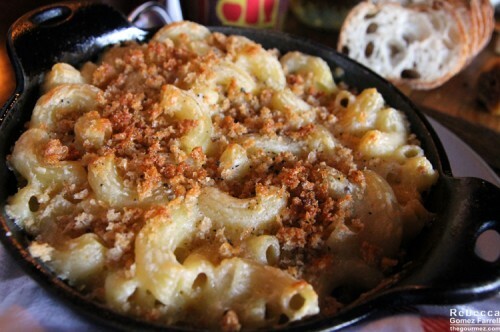 Part of its appeal comes from a strong cheddar presence, which is synonymous with a classic mac & cheese. I love deviations from traditional takes, but I like them most when they capture the original’s spirit and Fat Angel’s did that best. It’s on the pricier side at $12, but it is unquestionably worth it. The secret weapon is a ton of cayenne that ends up tasting like roasted jalapeno, providing a pleasing kick with each bite. Corkscrew pasta cooked near to falling apart achieved the proper textural balance, its crowning achievement. What have we learned from the completion of this series? That I like my mac & cheese with spicy heat,the noodles should have no memory of being in an al dente state, and I need a new excuse to consume so much cheese. 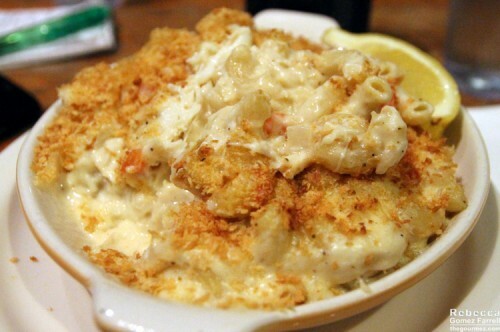 Feel free to share your own mac & cheese preferences and recommendations in the comments. There is no shame in loving Kraft. 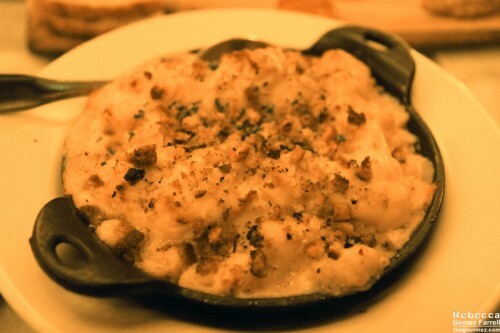 We all admitted that boxed mac & cheese is delightful. More powdered orange stuff, please!